The Philadelphia Eagles, who started the 1990 NFL season at 1-3, carried a 5-4 record into Atlanta as they took on the Falcons on November 18. Under brash Head Coach Buddy Ryan, the aggressive defense was the key to Philadelphia’s success, anchored by DE Reggie White and featuring other outstanding players such as DE Clyde Simmons, DT Jerome Brown, LB Seth Joyner, and CB Eric Allen. Exciting QB Randall Cunningham (pictured at right), fleet-footed as well as strong-armed, directed the offense that lacked a potent ground attack but benefited from the addition of rookie wide receivers Fred Barnett and Calvin Williams. Atlanta was struggling under first-year Head Coach Jerry Glanville. 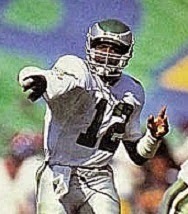 The wide-open passing offense was operated by QB Chris Miller and received a boost from the arrival of WR Andre Rison. However, the running game was only fair and while the defense was effective against the run, the backfield, despite the presence of rookie CB Deion Sanders, was prone to giving up big plays. There were 53,755 fans in attendance at Atlanta-Fulton County Stadium. The Falcons had the first possession and drove deep into Philadelphia territory, the big play being a pass from Chris Miller to WR Michael Haynes for 55 yards to the 11. RB Steve Broussard followed up with a seven-yard run to the four, but two more running plays gained two yards and, trying to convert on fourth-and-one, Broussard ran wide to his left and was tossed for a four-yard loss by Seth Joyner. The teams traded punts until, with just over three minutes remaining in the opening period, the Falcons commenced a 10-play, 73-yard series that extended into the second quarter. On a third-and-three play at the Philadelphia 40, Miller threw to Andre Rison for a 24-yard gain and that was followed by a pass interference penalty on Eric Allen that put the home team on the two yard line. Once again the Eagles defense proved difficult to penetrate, but the Falcons prevailed when RB Tracy Johnson ran for a touchdown from a yard out. Greg Davis added the extra point for the 7-0 lead. 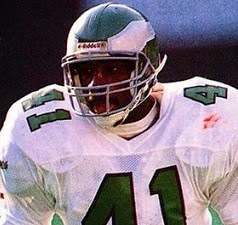 Philadelphia drove into Atlanta territory on the next possession, with RB Keith Byars (pictured below) gaining 20 yards on a carry from his 32 and Randall Cunningham completing two passes. However, penalties hindered the advance, including one that nullified an apparent TD throw to Fred Barnett, and the Eagles were forced to punt. The Falcons, pinned deep in their own territory, also had to punt but retained possession when WR Anthony Edwards fumbled on the return. Atlanta was still unable to move the ball and punted again shortly thereafter and the Eagles, taking over at their 21, went 79 yards in just four plays. Cunningham threw to Byars, who picked up 33 yards, and then to TE Keith Jackson for another 27 to the Atlanta 19. Following the two-minute warning, Calvin Williams ran for 18 yards on a reverse and Cunningham finished off the drive with a one-yard TD pass to Jackson. Roger Ruzek added the point after to tie the score. There was still 1:46 on the clock as the Falcons started a series that moved 25 yards in nine plays. Miller completed three passes to Rison, but three throws from the Philadelphia 36 fell incomplete and Davis kicked a 53-yard field goal that put the home team back on top by 10-7 at halftime. Neither team was able to move the ball well to start the third quarter until the Falcons, on their second series, put together a nine-play, 34-yard scoring drive. Miller completed four passes along the way, including three on consecutive plays, to set up another Davis field goal, this time from 46 yards. On Philadelphia’s next play following the ensuing kickoff, RB Heath Sherman fumbled and DE Tim Green recovered for the Falcons at the Eagles’ 35. In a series that extended into the fourth quarter, Atlanta chipped away and got a break when, after calling on Davis to successfully kick another field goal, a roughing-the-kicker penalty gave the Falcons a first down at the four. However, on first down Clyde Simmons sacked Miller for a six-yard loss and two passes fell incomplete. The home team still had to settle for a Davis field goal, this time from 28 yards. Atlanta was ahead by 16-7, but had missed an opportunity to take a more commanding lead. RB Thomas Sanders returned the kickoff 37 yards to the Philadelphia 35, and Cunningham went to the air, hitting Byars for five yards and Barnett for 29. The five-play series covered 65 yards as Cunningham completed one more throw to Jackson for a 17-yard touchdown. Ruzek converted and Atlanta’s lead was down to two points. The Falcons turned the ball over when a fumbled snap was recovered by Jerome Brown and the Eagles took full advantage on the next play when Cunningham fired to Williams for a 30-yard TD. Ruzek again converted and the visitors were in the lead by a score of 21-16. Now it was Atlanta’s turn to advance quickly down the field. Following two incompletions, Miller converted a third-and-ten play with a pass to WR George Thomas that picked up 50 yards. Another pass to Rison was good for a 23-yard touchdown and, with Davis converting the extra point, the Falcons were back in the lead by 23-21 with 8:30 to play. At this point the teams exchanged punts. Scott Fulhage’s 29-yard kick for the Falcons gave the Eagles the ball at their 47 and, with the clock now down to 3:26, Cunningham completed three passes to advance to the Atlanta 29. The drive stalled, but Ruzek’s 46-yard field goal attempt was successful and the visitors were back in front by one. In the time remaining, the Falcons were unable to come back as Miller threw an incomplete pass, exited the game due to a bruised sternum, and backup QB Scott Campbell had three more incompletions to effectively end the game. Philadelphia came away the winner by a score of 24-23. Atlanta led in total yards (315 to 279) and time of possession (35:51 to 24:09) while the teams were even in first downs with 16 apiece, although the Falcons had difficulty running the ball, gaining just 59 yards. The Eagles turned the ball over twice, to one by Atlanta, while the Falcons were penalized eight times, to seven flags thrown on Philadelphia. Randall Cunningham completed 16 of 27 passes for 214 yards and three touchdowns with none intercepted. Keith Byars had 7 catches for 78 yards in addition to rushing for 26 yards on three attempts. Keith Jackson contributed four receptions for 54 yards that included two TDs. Heath Sherman was Philadelphia’s leading rusher with just 27 yards on 11 carries. For the Falcons, Chris Miller was successful on 19 of 38 throws for 268 yards and a TD, also giving up no interceptions. Andre Rison (pictured at left) caught 7 passes for 88 yards and a touchdown and Michael Haynes added 70 yards on his three receptions. Steve Broussard ran for 25 yards on 10 attempts to top the club. The Eagles went 4-2 the rest of the way to finish second in the NFC East with a 10-6 record. They lost to Washington in the Wild Card round, their third straight failure to advance past the initial playoff game. Atlanta kept losing, reaching seven consecutive defeats before winning the final two games to end up at 5-11 and fourth in the NFC West. Randall Cunningham led the NFC with 30 touchdown passes and had his best year to date (his sixth) as he threw for 3466 yards with a completion percentage of 58.3 and a passer rating of 91.6. He also rushed for 942 yards and was named to the Pro Bowl as well as receiving MVP honors from the Pro Football Writers and the Bert Bell Award from the Maxwell Club as Player of the Year. Keith Byars led the club with 81 catches for 819 yards and Keith Jackson was a consensus first-team All-NFL choice with his 50 receptions for 670 yards. Andre Rison ranked second in the NFL in pass receptions (82) and TD catches (10) and third with 1208 yards. He was also a consensus first-team All-NFL as well as Pro Bowl selection.